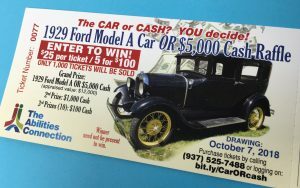 Would you like to win a restored 1929 Model A Deluxe Fordor Town Sedan? Or would you take the $5,000 in cash? TAC – The Abilities Connection will let you choose your grand prize if your winning ticket is drawn in the upcoming 1929 Model A Car OR Cash Raffle. The Springfield non-profit is selling chances to win the vintage car – or cash — in a raffle already generating excitement among people who have seen the donated car. A happy set of chance encounters and inquiries led to TAC receiving a donation (from a person who wishes to be anonymous) of a late restoration 1929 Model A car in great shape and good running condition. TAC was already planning to host a fundraising Cruise-In this summer; the vintage car donation just added to the anticipation of the event. “This has turned into the ‘year of transportation’ for TAC,” said TAC Communications / Development / Marketing Coordinator Tracey Hanlin. Because vehicles are needed at TAC, the raffle proceeds will be used to purchase a new community inclusion vehicle to transport people with developmental disabilities on outings, to work in the community, and to/from work at TAC. “Your odds of winning are very good,” she added. Only 1,000 tickets were printed for the drawing. Second prize is $1,000 cash; there will be ten 3rd place winning tickets drawn for $100 each. Raffle tickets for the Car / Cash Raffle are $25 each or 5 tickets for $100. They are available online (www.bit.ly/CarORcash), or by phone: (937) 525-7488. 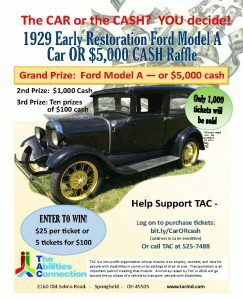 Anyone wishing to buy tickets may stop by TAC- The Abilities Connection at 2160 Old Selma Road, Springfield, OH 45505 between Monday and Friday, 7 a.m. – 3:30 p.m. Tickets will also be sold at the TAC Cruise-In on June 22 (5-9 p.m.). Credit and debit cards are welcome. The Car OR Cash raffle will be promoted well beyond the borders of Springfield and Clark County, especially to car enthusiasts and collectors. All 1,000 tickets are sure to be sold, she said, so she is encouraging people to buy their chance to win early. “When they’re gone, they’re gone,” she warned. The winners of the Car / Cash Raffle will be drawn on October 7, 2018 at the 5th annual The Auction Connection event. Winners need not be present to win. For complete terms and conditions of the raffle log on: www.bit.ly/Car-CashRules.